What do you see when you look at this image? Tomás R. Guilarte asks his 8-year-old daughter Sofia this very question, curious about her young mind’s interpretation of this and several other pictures. They are all images of brain cells in culture he has brought home from work. Guilarte is dean of Robert Stempel College of Public Health & Social Work and an expert in the fields of neuroscience and neurotoxicology. He is also a professor of environmental health sciences and cognitive neuroscience and imaging. Sofia tells him she sees a green octopus with bright blue eyes (upper left corner). 3) the roots of a tree, veining deep into the ground. Guilarte prepared the same activity for an attentive audience at “Beauty and the Brain: Connecting Art to Science,” as part of the Mixtape Mondays lecture series at the Patricia and Phillip Frost Museum. 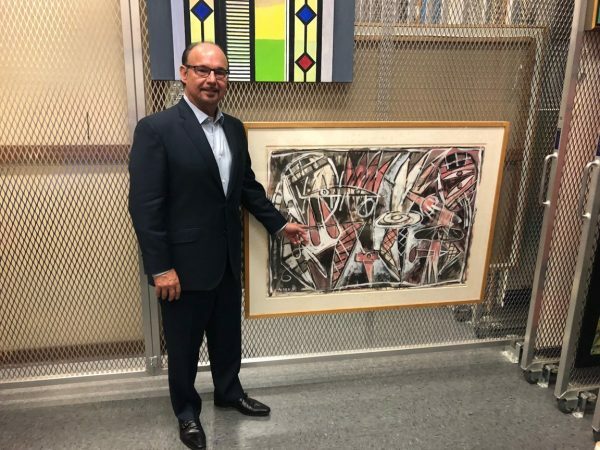 Mixtape Mondays features FIU faculty across disciplines, welcoming them to present their innovative research and studies in relation to art and the museum’s collection. Guilarte shared his research on the detrimental effects of environmental pollutants – such as heavy metals – on neurological and mental health. Presented with the colorful images of the cells, the room-filled audience gave similarly imaginative answers. Some said the “orchid” looked like a “chicken with a very long neck,” and the “roots” were reminiscent of the aerial view of a cityscape with its twinkling “lights,” which are actually synapses. Guilarte was excited to integrate art into the lecture, easing the understanding of these concepts by connecting notions that are seemingly unrelated. “I’m very visual. I see pictures, and just like the ones I showed, I begin to see shapes, animals and objects,” he said. This exercise, like any puzzle, is an excellent workout for the brain, one that Guilarte says promotes neuroplasticity (the creation of new neural connections) and neurogenesis (the growth of new brain cells). And other studies also agree, proving that regularly practicing art enhances brain connectivity. But keeping our brains healthy is a difficult task when considering the cluster of harmful compounds that we are exposed to on a daily basis. “We live in a soup of chemicals, we have to minimize our exposure and properly feed our brains,” said Guilarte. Because our brain’s susceptibility to injury from exposure to environmental pollutants is remarkably high, it is vital to prevent the loss of neurons and promote the growth of new ones. Though the traditional route of adopting a balanced diet and exercise regimen along with not smoking is still highly recommended, Guilarte emphasized the somewhat unconventional yet impactful role of art – both its consumption and creation – in the birth of new neurons and their integration into brain circuits that can enhance learning and memory. “And though genetics matter, it appears art is exceptional for our minds and our longevity,” he said. So, the next time you stop by a museum, keep a few things in mind about art: it improves brain function, brain wave patterns, fine-motor skills, creativity, and our social and emotional development. It may now help us lead healthier lives too. Mixtape Mondays is hosted once a month at the Patricia and Phillip Frost Art Museum. For the museum’s event calendar, click here. The images provided were obtained by previous doctoral students in Guilarte’s lab. 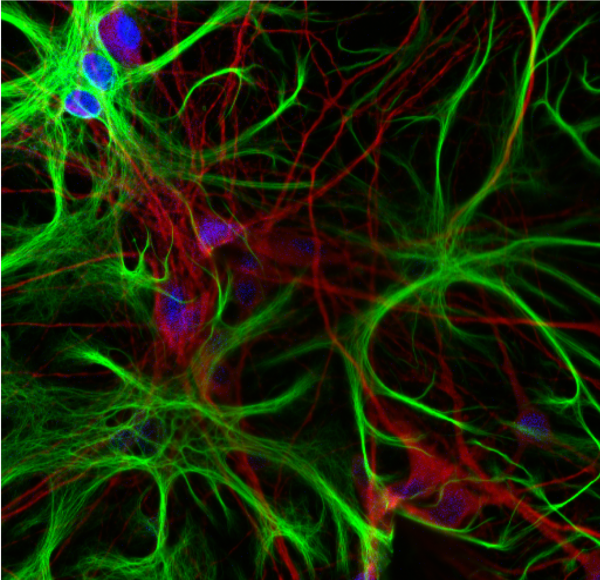 The picture of a presumed “octopus” is a mixed culture of astrocytes (green) and neurons (red) with nuclear staining (blue) taken by Kirstie Stansfield. The images of the “galaxy” and “orchid” are images of primary microglia in culture taken by Meredith Loth. The “roots of a tree” image is of a hippocampal neuron (green) in culture with each red dot representative of a dendritic spine where other neurons form synapses for communication. The image was taken by April Neal.